Karen has sold over 100 Million Dollars of Real Estate and was named one of the Top 25 Real Estate agents in the Tampa Bay Area by the Tampa Bay Business Journal as well as being named Agent of the year and Buyers Agent of the Year multiple times over her career. This continuing success is due to her keen eye for seeing beyond the obvious, stemming back to when she owned and operated an interior design firm for over ten years. Karen began her Real Estate career as a buyer’s Agent specializing in corporate relocation covering the entire Tampa Bay area. After a few years Karen decided that she could use her knowledge of what buyers are looking for to assist sellers as well. Karen‘s ability allows her to provide suggestions for those buying or staging homes so as to maximize its value, and minimize the time a house remains on the market. Karen’s diverse background allows her to accentuate the positive features and provide cognitive responses to questions that potential buyers often have. Karen has strong ties and a proven commitment to our community. 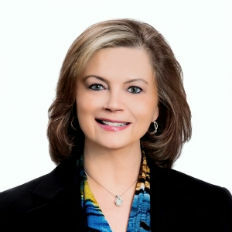 She currently serves as President of the USF Bulls Club Board, is a member of the USF Foundation Board and still finds time to help numerous groups including New Tampa Rotary, New Tampa Community Council and remains the only woman to have served as the chairperson of Tampa Palms Golf & Country Club Board of Directors. Karen moved to Tampa in the early 1960’s when her father was stationed a MacDill AFB. She has been a resident of New Tampa for over 25 years, met her husband Renynold at University of South Florida and has one daughter, Michelle. Karen is ready to use her extensive knowledge of the Tampa Bay area and the resources of Tampa Bay’s leading real estate firm for the past 35 years to assist you in selling your home or finding the right house that will become your home. Karen specializes in the Tampa Bay area, with concentrations on New Tampa including but not limited to: Tampa Palms, Hunters Green, Meadow Pointe, Temple Terrace, Carrollwood, South Tampa, Brandon as well as Pasco County including Seven Oaks and surrounding communities.